Forum Le Monde en Guerre - Deux soldats allemagne - morts - location svp? Deux soldats allemagne - morts - location svp? Two Soldiers Died thesis HAD When My father found 'em. Does anyone Know the location - Ju am sure it WAS in France. I'll HAD found after D-Day. Dernière édition par paulcheall le 24 Oct 2010, 18:06, édité 1 fois. Re: Deux soldats allemagne - morts - location svp? Not soldiers but railway (reichsbahn) employees. carlo a écrit: Not soldiers but railway (reichsbahn) employees. Wow! after many years my father has believed they were soldiers. He recorded finding them in his journal after D-Day. Thank you. I wonder what they would have been doing near the action in N France. I'm not sure than the photo was taken in France. Perhaps I'm wrong, but the inscription on the memorial seems to be German. Could you scan the zone with a better definition? I think Yvonnick is right. Seems german for me to. Hi Yvonne - sorry to have taken such longtemps! "Das dankbare Willenber** seinen taoleren Sohnen"
Alors c'est Allemagne. Les soldats morts etait en France quand mon pere les a trouve. Je pense qui'lls etait soldats, mais chez leur ills travaillent au chemin de fer. I do not wish to search further out of respect for the dead. It may be upsetting to any family if we were to find them? What do people think? 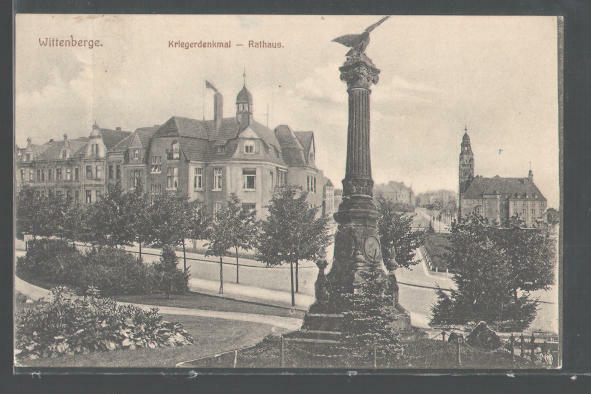 Le texte du monument dit/the text says : "Das dankbare Wittenberge - seinen tapferen Söhnen" _ La ville Wittenberge, reconnaissante envers ses courageux fils/the city of Wittenberge thanks hers courageous sons. C'est un monument aux morts, vraisemblablement de la guerre de 1870/It's a monument for the dead soldiers, I think for the 1870-71 war. Ceux d'après 18 sont d'un style différent en général/the style of those monuments after 1918 have usually a different style. Pas de trace du monument aujourd'hui. Sans doute détruit durant la 2e guerre/No trace of the monument today. May have be destroyed during WWII. Signal a écrit: Trouvé/found !